By booking a seat on the shared shuttle, dragging your suitcases from one mode of transport to another will no longer be a problem during your holiday! In fact, the driver will be waiting for you in front of the information point in the arrivals hall and your suitcases will be stowed comfortably and carefully in your vehicle, (unlike what often happens on the bus service). You will be able to relax during your journey to the wonderful world of Disney, breathing in the holiday atmosphere without a care in the world. Forget about searching endlessly for the right bus stop or the nearest metro station. Forget about the stress of travelling on public transport and relax on an airport shuttle: a people carrier that can accommodate up to 8 people in comfort and at a competitive price. Orly Airport is the second largest in the French capital and is about 25 kilometres from the centre of Paris. It is situated approximately 55 kilometres from Disneyland Paris. This amusement park which is dedicated to the Disney characters is the most famous in Europe and is situated in the Mane la Vallée district to the south east of Paris. In order to reach this magical world, the quickest and least congested route is via the A4 motorway. The average journey time is around 1 hour and 30 mintues which may seem excessive when you look at the distance but, due to the frequent queues exiting the airport and at the entrance to the amusement park, it is actually more than realistic. The cost of the shuttle is fixed, regardless of the actual journey time and again, because of this, you will be able to travel calmly without any nasty surprises regarding the pricing at your journey's end. When you are travelling, don't you want to ensure that you have a comfortable and punctual means of transport? Aren't you also looking for convenience? We have got the perfect solution for anyone who is looking for a comfortable mode of transport from Orly Airport to their accommodation at Disneyland Paris. In this afticle, you will find all the details you need about the shuttle from Orly Airport with a shared service that can take a maximum of 8 passengers and will revolutionise your ideas about transport. This really economical solution is perfect for anyone who wants to travel stress-free! 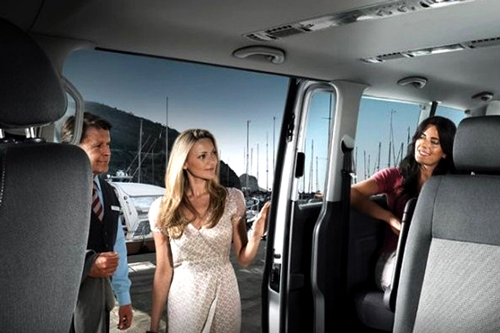 The shuttle service is available every day of the week, including pulbic holidays, from 05:00 to 21:30 hours. The estimated departure time for the shuttle is approximately 30 minutes after the flight's arrival. In fact, at the time of booking, you will be required to provide the arrival time and the flight number in order to ensure a punctual and professional service. On the other hand, in regards to the booking for your return journey: it will be necessary to stipulate the pick-up time (from your accommodation at Disneyland) allowing at least three hours prior to the scheduled departure time. For example, if the flight leaves at 11:00, you would need to specify a pick-up from the hotel at 08:00 hours. By doing this, you can ensure that you don't have to worry about your trip and despite the high volumes of Parisian traffic, you will be sure of arriving at the airport in time for your flight. The cost can be seen in the table below or simply by completing the attached form. As you can see from the table: the more passengers there are travelling with you, the greater the saving. To share is lovely and it is convenient too with the airport shuttle! In order to book a seat on the Orly Airport Shuttle, just select the booking form for Orly Airport - Disneyland and continue to fill out the requested details. If you also want to book the return journey, just click on the option that says "Yes, I want the return journey with a discount," and continue to fill out the details. On the same page you will be able to see the total amount payable and the amount of deposit payable in order to secure the booking. The full payment should be settled with the driver, in cash, on the day of the transfer.